A while ago I met two fellow Portuguese riders at a Ducati open house in Metuchen near the place where I work. I was ogling a beautiful red Ducati when I hear someone speaking Portuguese behind me, I turn around and introduce myself, turns out they ride Ducatis' and one of them actually owns two Ducatis. We struck a friendship, exchange e-mails and decide we would get together for a ride at a future date. They live in northern New Jersey while I live in the south but they tell me every Sunday a group of Portuguese and Brazilians riders gather in Newark which is about half way for all of us. 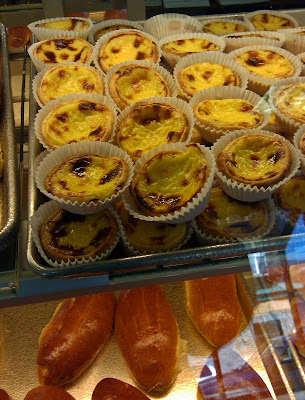 It also happens that the meeting place is at a Portuguese/Brazilian bakery which is convenient since I have a very sweet tooth. Last month I decided to take a ride to Newark and meet them at the "Cafe Cafe" Bakery, don't ask, it's not a typing mistake, that is the name of the bakery. I arrive at the bakery around 9 am and find quite a number of bikes already there. I go inside and proceed to have a warm cup of coffee and a "Pastel de Nata", the ones on the above picture. After a little chit-chat we leave Newark and head north on the NJ Turnpike (I95) towards the George Washington Bridge where we pickup the Palisades Interstate Parkway and head north along the Hudson river towards the New York border. We enter Harriman State Park and make the first stop where I spend some time admiring the beautiful lines of the Ducati 996. Ducati does have beautiful motorcycles. At 46,613 acres (188.64 km2), Harriman State Park is the second largest state park in New York. The park is also known for its 31 lakes and great vistas. I spend some time walking around taking in the beautiful fall colors. It's the perfect time of the year to visit this area of New York state, it's not too cold, not too many people on the road and the park offers some beautiful and winding roads. The yellows, oranges, reds and the few leftover greens of the leaves are just breathtaking. The park has 31 lakes, I will have to go back in the summer and spend time hiking the area to really appreciate the beauty. You find beautiful vistas no matter where you look. Sergio and To Ze, my two Portuguese buddies had brought along a few of their friends. I return to the group and we spend some time talking about bikes and previous bike adventures. The group consists of two Ducatis, two Suzukis, one BMW and my Kawasaki Concours. We leave the area and continue north entering Bear Mountain State Park and climbing Bear Mountain where we make our next stop. Bear Mountain is one of the best-known peaks of New York's Hudson Highlands. Along the way we pass various groups of riders enjoying the beautiful "7 Lakes Drive"
The climb to the summit is along a beautiful and winding paved road and at the top you find the Perkins Memorial Tower, an observatory offering a beautiful view of the Hudson River and the surrounding park. There's literally hundreds of bikes at the top, dirt bikes, cruisers, sport bikes but only two instantaneously catch my eye. A beautiful deep blue Yamaha R1 with Ferrari stickers, obviously a Ferrari fan, I later find out the owner collects Ferrari toy model cars just like me, maybe I should put some Ferrari stickers on my Concours. The other is a green Kawasaki Ninja. I have always had a soft spot for pure sport bikes and these are two of my favorites. We leave the mountain, cross the Hudson river and then come down on the eastern side stopping in Tarrytown for lunch. Obviously we pick a Portuguese restaurant. After lunch we cross the Tappan Zee bridge going west on the New York Thruway picking up the Garden State Parkway and heading south splitting up a little later, each one of us heading home in a different direction. I did a little over 200 leisurely miles on this day. Nice ride report and pics! Wonderful fall colors still showing. Harriman State Park looks like the kind of place to visit in every season. Wow, great post on a great adventure, George. That is really cool how you met these guys then went on a beautiful ride, even with beautiful pastries! Nice photography and I too like those sport bikes. The lines and the colors make them eye-candy. Bluekat: Thanks, the park is beautiful, I have been there twice but didn't spend a lot of time, sometimes that's the problem when you ride in a group :-) The Catskills area of NY is known for the fall colors. Mike: Unfortunately I like ALL sport bikes but I'm getting old for that :-( thus the Tenere for adventure. I might still get a sport bike for short rides around NJ. The Blue R1 was stunning. Got to agree, Ducati makes a nice bike. In a perfect world I'd have a representative from all the different countries... BMW, Ducati, HD, Honda... If I'm lucky, I one one at one point in my life. Also looks like you got out just as the leaves started to change - what a great time of year to get out and ride.